I have mixed feelings about cheap beer. Beer is high in calories for a beverage and if I’m going to spend it I like to taste it. But a pint of Pabst Blue Ribbon or can of Hamm’s can be quite refreshing on a hot day and I can drink a couple and not feel heavy headed. And the best thing about cheap beer? It’s cheap. Here are a few of my favorite spots in Portland to drink cheap beer. The Standard – At this Northeast hidden gem you can drink Rainier on Monday and Hamm’s on Wednesday for a buck a can. Yes folks, for one dollar you can sip an adult beverage, play shuffleboard, or lounge in their large patio. Save your remaining dollars for the county fair-esque photo booth. Zach’s Shack – Known for their delicious dogs and late-night hours, Zach’s Shack on Hawthorne has one dynamite refrigeration system. Their cans of PBR are the coldest in town. During their extended happy hour (4 p.m. – 8 p.m. every day), you can chase away the heat for $1.25. Captain Ankeny’s Well – Probably best known for their authentic deep dish pizza, Captain Ankeny’s has the most variety I’ve seen when it comes to happy hours. $1.25 on select pints some nights, $1.95 select small pitchers on others, sometimes only $0.50 off. But if you land on the right night of the week between 4 p.m. and 7 p.m., you can drink – and eat – for dollars. Cheap beer is plentiful, even in the land of $5 microbrews. 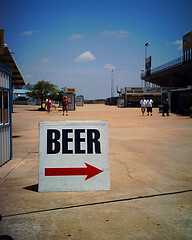 Where’s your favorite place to knock back a cold one for a buck or two?